This book looks deceptively pristine - it is a new copy. The much-thumbed original resides in the parential home, where I first discovered it. That copy is tatty, the beautiful waxed paper torn and many times repaired. Its pages are covered in food splats and rings of red wine. All signs of frequent use. It was one of many cookbooks that my dad, always passionate about food, bought. 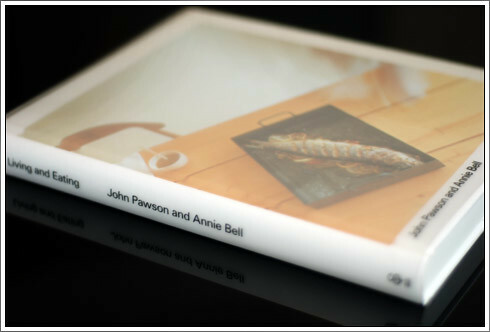 It is not simply a cookbook - John Pawson is an architect, and it is his wife, Annie Bell who writes the recipes. So this book contains not just recipes, but a design for living, so to speak. They appear to live an incredibly minimal life, with no clutter anywhere to be seen. I think my other half would be greatly appreciative if I were to take a leaf out of this book, but it's never going to happen. I'd love to live a pristine, zen-like existence, but unfortunately a trail of mess, dirty utensils, washing up and flour tends to follow me wherever I go. The recipes are gorgeous though, and this mustn't be overlooked. It is arranged by the stages of a meal: starters, soups and pasta, then by fish and meat type, salads and finally desserts. The final section is devoted to explaining the Pawson/Bell lifestyle manifesto. But back to the recipes. My personal favourites are the buckwheat noodles with gorgonzola and rocket, the roasted garlic with goats cheese and parma ham, the chicken baked in sea salt and lapsang souchong and the gorgeous butternut squash soup. Not being a sweet tooth, it shames me to admit I have not tried any of the desserts. I also love the photography in the book. It is not heavily illustrated - there's a picture about every third page - but the photos are gorgeous with beautiful clean lines. They don't just focus on the food, but serve to illustrate the lifestyle embraced by the book's authors. Sadly it appears to be out of print these days, but there are plenty of copies to be found on Amazon and eBay. Don't forget, there's still time to enter our competition to win a copy of The Flavour Thesaurus. Click here and leave a comment - I'll draw the winner on the 17th July.